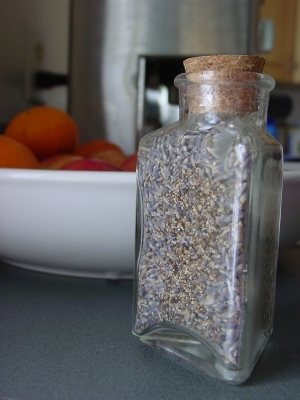 I don’t know how this bottle of dried lavender got into my cabinet, but it needed to be put to good use. And, as the snow continues to swirl, and the temperatures continue to dip, I needed to remind myself of seasons — warmer, sunnier seasons — that aren’t winter. So I found a recipe for lavender-inflused biscotti and modified it a bit. They’re mildly sweet and largely taste of citrus, but the floral notes of the lavender poke gently through, adding complexity to the cookie. Preheat oven to 350 degrees. Adjust oven rack to the middle position. Line a baking sheet with parchment paper. In a medium bowl, sift flour, baking powder, baking soda, and salt together; set aside. In a large bowl, whisk sugar and eggs to a light lemon color; stir in honey, vanilla extract, zest, and lavender blossoms. Sprinkle dry ingredients over the egg mixture; fold in until the dough is just combined. Add more flour until dough becomes less sticky (I used about 3 more tablespoons). To shape the dough into a log, lightly sprinkle flour on the work surface, on top of the dough, and on your hands. (Use just enough flour to form the loaves; you don’t want the logs to be covered with flour.) Divide dough into two parts and shape each piece into a loaf approximately 3 inches wide, 7 inches long, and 3/4-inch high. Place loaves onto baking sheet with 3 to 4 inches of space between them. Bake 25 minutes or until dough pops back up when lightly pressed with a finger. Remove from oven and cool 10 minutes on a wire rack. Reduce oven to 275 degrees. Using a long serrated knife, cut logs diagonally into 1/2-inch thick slices. Turn the slices over, onto their sides; return slices, on baking sheets, to oven. Bake another 15 to 20 minutes. NOTE: Do not crowd the biscotti slices on the baking sheet for their second baking as they need the hot air to circulate to enable them to crisp up evenly. Remember biscotti will continue to crisp up as they cool. Remove from oven and cool completely on wire racks. Store biscotti in an airtight container. They will keep well for a few weeks. Yields about 27 biscotti. ← Retro Recipe Challenge #6 Deadline: Only 36 Hours Left!